From any vantage point in Bolivia's largest city, Evo Morales' new presidential residence is hard to miss. 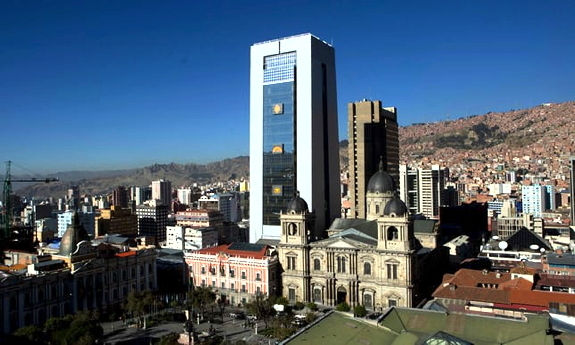 The 29-storey glass-fronted skyscraper towers over the low-rise historic centre of La Paz. For Morales and his supporters, it represents a new Bolivia, a break from a painful colonial past. For others it is an overpriced vanity project aimed at glorifying the country's longest-serving leader. Bolivia's communications minister, Gisela López, refused to confirm or deny the report but said the high-rise had been built "for the people" without running over a $34m budget, the state news agency reported. But the building has also become a focal point for growing anger at Morales' refusal to relinquish power after 12 years and his vow to run for a fourth term in the country's 2019 elections. "We leave behind the palace of a colonial state to come here to the People's Great House of the plurinational state of Bolivia," he said in a speech, which listed the many presidents and independence leaders who had been killed inside or near the old palace during Bolivia's tumultuous past. "It's another historic milestone thanks to the struggle of the Bolivian people." At 120 metres tall, the newly completed People's Great House or Casa Grande del Pueblo looms overthe old government palace, which it replaces. Its replacement flouts municipal bylaws prohibiting high-rise constructions in the city centre but Morales used his party's parliamentary majority to override the ban. "It's an insult to the country," Carlos Toranzo, a political analyst, told the Guardian. "(Morales) wants to immortalise himself with a building which is not only anti-aesthetic but also anti-ethical because in Bolivia we don't have even the right to be ill," he added, referring to the city's woefully under-resourced main hospital. Opposition leader Samuel Doria said the new building should be turned into a cancer hospital which, he insists, is an urgent necessity in the country that remains one of South America's poorest, despite a decade of strong growth. Topped with a helipad and with three underground floors, the glass-fronted tower has architectural features resembling Tiwanaku, Bolivia's preeminent archeological site. It features indigenous symbols such as the chakana, or Andean cross, and has several large murals, some of which depict workers overcoming social injustice.